I came across this free pattern for the Snappy Mani Pouch 2 on the Robert Kaufman site last week, and thought it looked fun and easy to make. I have lots of leftovers from projects and this project used several different prints, so I went in search of some. There are basically 2 sections to put together, the zipper pocket and the polish pocket. The nail polish pocket is gathered top and bottom for fullness, and you sew dividers into it to make 4 pockets. I think this would be a handy travel pouch for makeup too, but I would probably only make 2 sections for makeup since you can't put anything very tall in the pocket and still fold the top over it. Here is the front. I used velcro for the closure and it was finished! Maybe a 2 hour project? What a cute gift for a friend! What other uses could you see for these? I am going to my family reunion today in my hometown....should be fun! 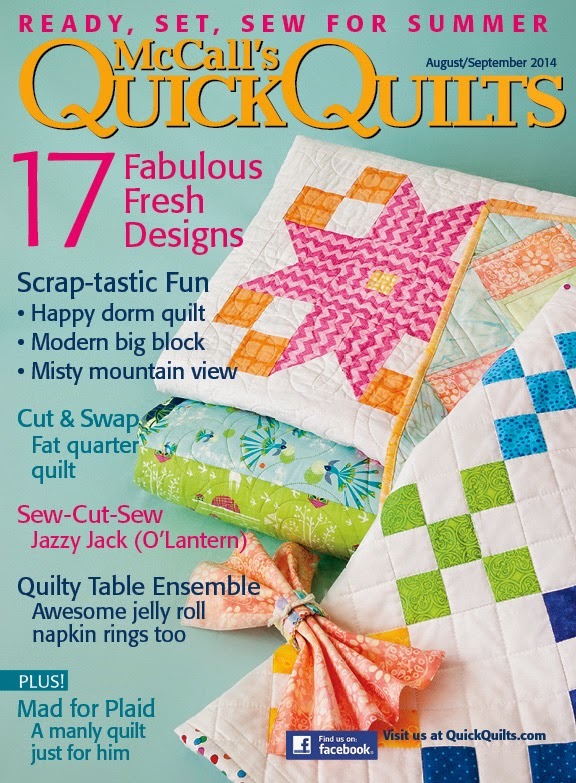 I'm still celebrating the publication of Fade to Pink in McCalls Quick Quilts magazine...enter the giveaway if you haven't already and stay tuned for another one tomorrow! I love these little bags I can see I would have to make a lot of these I better learn quick. Have fun today at the reunion. I had printed this pattern the beginning of June and still haven't made one! Yours turned out so cute! Hopefully i can accomplish some things this week~ have a great week! What a lovely way to use up leftovers.